What is the difference between Promises and Observables? Can someone please explain the difference between Promise and Observable in Angular? An example on each would be helpful in understanding both the cases. In what scenario can we use each case? A Promise handles a single event when an async operation completes or fails. Note: There are Promise libraries out there that support cancellation, but ES6 Promise doesn't so far. An Observable is like a Stream (in many languages) and allows to pass zero or more events where the callback is called for each event. Often Observable is preferred over Promise because it provides the features of Promise and more. 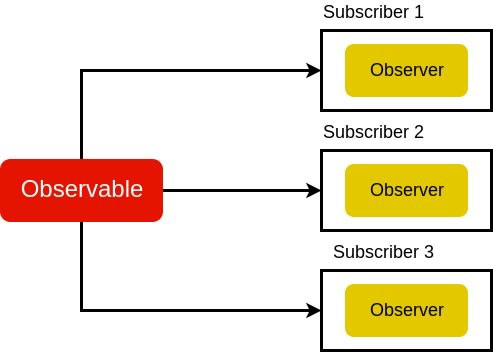 With Observable it doesn't matter if you want to handle 0, 1, or multiple events. You can utilize the same API in each case. 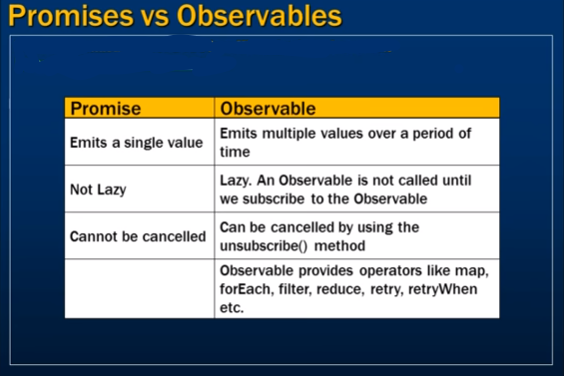 Observable also has the advantage over Promise to be cancelable. If the result of an HTTP request to a server or some other expensive async operation isn't needed anymore, the Subscription of an Observable allows to cancel the subscription, while a Promise will eventually call the success or failed callback even when you don't need the notification or the result it provides anymore. There are also powerful operators like retry(), or replay(), ... that are often quite handy. Both Promises and Observables provide us with abstractions that help us deal with the asynchronous nature of our applications. The difference between them was pointed out clearly by @Günter and @Relu. Since a code snippet is worth a thousand words, let go through the below example to understand them easier. Angular uses Rx.js Observables instead of promises for dealing with HTTP. Suppose that you are building a search function that should instantly show you results as you type. Sound familiar but there are a lot of challenges that come with that task. We don't want to hit the server endpoint every time user presses a key, it should flood them with a storm of HTTP requests. Basically, we only want to hit it once the user has stopped typing instead of with every keystroke. Don’t hit the search endpoint with the same query params for subsequent requests. Deal with out-of-order responses. When we have multiple requests in-flight at the same time we must account for cases where they come back in unexpected order. Imagine we first type computer, stop, a request goes out, we type car, stop, a request goes out. Now we have two requests in-flight. Unfortunately, the request that carries the results for computer comes back after the request that carries the results for car. The demo will simply consist of two files: app.ts and wikipedia-service.ts. In a real world scenario, we would most likely split things further up, though. Below is Promise-based implementation that doesn’t handle any of the described edge cases. We are injecting the Jsonp service to make a GET request against the Wikipedia API with a given search term. Notice that we call toPromise in order to get from an Observable<Response> to a Promise<Response>. Eventually end up with a Promise<Array<string>> as the return type of our search method. Not much of a surprise here either. We inject our WikipediaService and expose it’s functionality via a search method to the template. The template simply binds to keyup and calls search(term.value). We unwrap the result of the Promise that the search method of the WikipediaService returns and expose it as a simple Array of strings to the template so that we can have *ngFor loop through it and build up a list for us. To unveil such super powers we first need to get an Observable<string> that carries the search term that the user types in. Instead of manually binding to the keyup event, we can take advantage of Angular’s formControl directive. To use this directive, we first need to import the ReactiveFormsModule into our application module. Once imported, we can use formControl from within our template and set it to the name "term". In our component, we create an instance of FormControl from @angular/form and expose it as a field under the name term on our component. Behind the scenes, term automatically exposes an Observable<string> as property valueChanges that we can subscribe to. Now that we have an Observable<string>, overcoming the user input is as easy as calling debounceTime(400) on our Observable. This will return a new Observable<string> that will only emit a new value when there haven’t been coming new values for 400ms. Definition : Helps you run functions asynchronously, and use their return values (or exceptions) but only once when executed. Definition : Helps you run functions asynchronously, and use their return values in a continous sequence(multiple times) when executed. By default, it is Lazy as it emits values when time progresses. Has a lot of operator which simplifies coding effort. One operator retry can be used to retry when ever needed, also if we need to retry the observable based on some conditions retryWhen can be used. Further reading: How can I `await` on an Rx Observable? 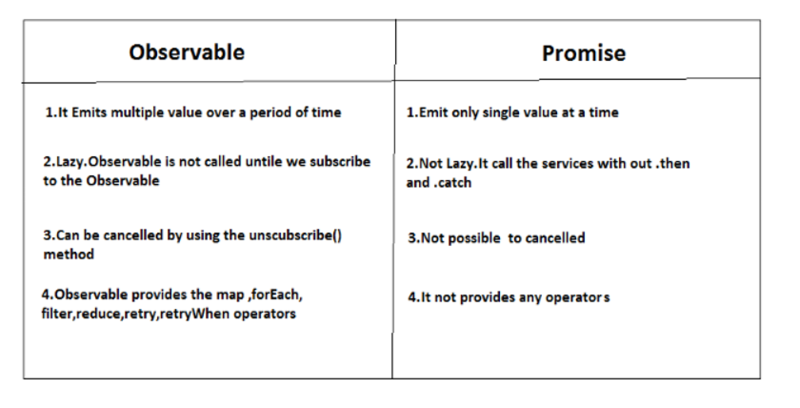 promises and Observable both are handling the asynchronous call only.find above image for main difference. Observable is just a function that takes an observer and returns a function Observer: an object with next, error. Observer provides a function to handle next value,errors and end of stream(ui events,http responses,data with web sockets). It is cancel-able/retry-able and supports operators such as map,filter,reduce etc. I believe all the other answers should clear your doubts. Nevertheless, I just wanted to add that observables are based on functional programming, and I find very useful the functions that come with it like map, flatmap, reduce, zip. The consistency the web achieves especially when it depends on API requests is a brutal improvement. I strongly recommend this documentation, since it's the official documentation of reactiveX and I find it to be the most clear out there. Although it's meant for RxJava, the concepts are the same, and it's really well explained. In reactiveX documentation, you have the equivalences for each function. You must look for RxJS. In an Angular2 project I have a service that takes some parameters and returns a value list to populate drop down menus on a form. When the form component initializes, I need to call the same service multiple times with different parameters to define a number of different dropdown menus, however if I simply queue up all the variables to call the service, only the last one succeeds and the rest error out. The service fetching from the database could only handle one request at a time. The only way to successfully populate all the dropdown menu variables was to call the service in a way that prevented a new request from being processed until the last request was finished, and the Promise / .then mechanism solved the problem nicely. I defined the functions in the component, and then called initializeDropDowns() in ngOnInit. The fetchValueList function returns a Promise, so the first call passes the first listCode and when the Promise resolves, the return value is in the data variable in the .then block where we can assign it to the this.firstValList variable. As the function has returned data, we know the service has finished and it's safe to call again with the second listCode, the return value is in the data variable in the next .then block and we assign it to the this.secondValList variable. We can chain this as many times as required to populate all the variables, and on the last code block we simply omit the return statement and the block terminates. This is a very specific use case where we have a single service that needs to be called multiple times as the component initializes, and where the service has to complete its fetch and return a value before it can be called again, but in this case, the Promise / .then method was ideal. You can use promises instead of observables when calling HTTP in Angular if you wish. Both Promises and Observables help us dealing with asynchronous operations. They can call certain callbacks when these asynchronous operations are done. You can always use an observable for dealing with asynchronous behaviour since an observable has the all functionality which a promise offers (+ extra). However sometimes this extra functionality that Observables offer is not needed. Then it would be extra overhead to import a library for it in order to use them. So a promise executes some code where it either resolves or rejects. If either resolve or reject is called the promise goes from a pending state to either a resolved or rejected state. When the promise state is resolved the then() method is called. When the promise state is rejected, the catch() method is called. User events, e.g. click, or keyup events. The user generates events (data) over time. Websockets, after the client makes a websocket connection to the server it pushes data over time. When creating an observable it requires a callback function which supplies an observer as an argument. On this observer you then can call onNext, onCompleted, onError. Then when the Observable is subscribed to it will call the corresponding callbacks passed into the subscription. Promise - Provide a single future value. Not lazy . Not cancel-able. It will either reject or resolve. Observable - Provide multiple future value. Lazy . Cancel-able . It provide other methods live map,filter,reduce. One basic difference between them is that the observable provide ways to cancel a request and resend a new one. Where as promise don't allow such feature. Also, Promise emits a single value while Observable emits multiple values. So, while handling a HTTP request, Promise can manage a single response for the same request, but what if there are multiple responses to the same request, then we have to use Observable. 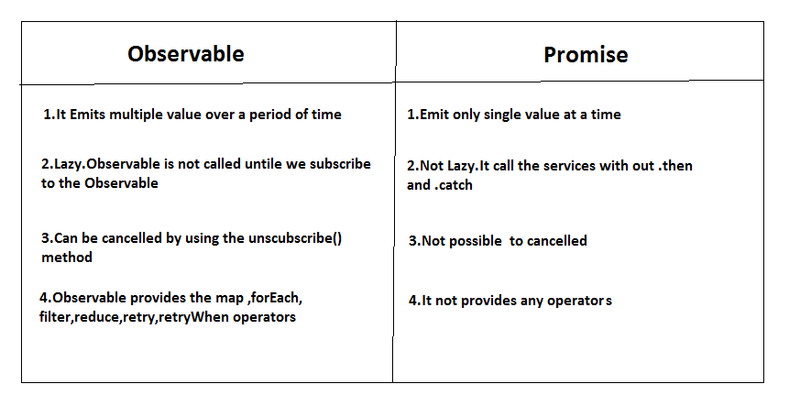 Below are some important differences in promises & Observables. Can be shared and subscribed that shared value by multiple subscribers. And all the subscribers will execute at a single point of time. Chirag is a new contributor to this site. Take care in asking for clarification, commenting, and answering. Check out our Code of Conduct. Observable is better, it has all Promises features plus extra features. One Time Use "Return data once"
While the accepted answer is good in general I don't think it emphasises that when dealing with Angular Components you almost always want to use an Observable because it supports cancelation. Promises cannot be cancelled and will resolve even if your component is destroyed. Angular tends to be forgiving until it's not. If your component is destroyed before the promise is resolved, you'll get an attempt to use destroyed view error when the promise is resolved. Alternatively, if you use observables with the takeUntil pattern, then as soon as your component is destroyed the subscription will be cancelled. Something I ran into that wasn't apparent from a first reading of the tutorial and docs was the idea of multicasting. Make sure you're aware that by default, multiple subscriptions will trigger multiple executions in an Observable. Multiple subscriptions to a single HTTP call Observable will trigger multiple identical HTTP calls unless you .share() (enable multicasting). A promise forces you to deal with one thing at a time, unwrap its data, handle exceptions, has language support for cool things like async/await, and is pretty barebones otherwise. An Observable has lots of bells and whistles, but you need to understand the power you're working with or it can be misused. I see a lot of people using the argument that Observable are "cancellable" but it is rather trivial to make Promise "cancellable"
An Async Event Handler - The Promise object represents the eventual completion (or failure) of an asynchronous operation, and its resulting value. Observables are lazy collections of multiple values over time. its really a great approach for async operations. it can be done with rxjs which has cross platform support can use with angular/react etc. its act like stream liner. can be multi pipeline. so once defined you can subscribe to get return results in many places. since it support multi pipeline you can subscribe result in different location, it has much possibilities than promises. There are lots of answers on this topic already so I wouldn't add a redundant one. But to someone who just started learning Observable / Angular and wonders which one to use compare with Promise, I would recommend you keep everything Observable and convert all existing Promises in your project to Observable. Simply because Angular framework itself and it's community are all using Observable. So it would be beneficial when you integrate framework services or 3rd party modules and chaining everything together. While I appreciate all the downvotes but I still insist my opinion above unless someone put a proper comment to list a few scenarios that might still be useful in your Angular project to use Promises over Observables. Of course, no opinion is 100% correct in all cases but at least I think 98% of the time for regular commercial projects implemented in Angular framework, Observable is the right way to go. Even if you don't like it at the starting point of your simple hobby project, you'll soon realise almost all components you interact with in Angular, and most of the Angular friendly 3rd party framework are using Observables, and then you'll ended up constantly converting your Promise to Observable in order to communicate with them. Those components includes but not limited to: HttpClient, Form builder, Angular material modules/dialogs, Ngrx store/effects and ngx-bootstrap. In fact, the only Promise from Angular eco-system I dealt with in the past 2 years is APP_INITIALIZER. Not the answer you're looking for? Browse other questions tagged angular promise rxjs angular-promise angular-observable or ask your own question. Promise vs Observable for Http in Angular2? Difference between observables and promises in AngularJS. Observable in angular 2 ? What is a purpose of using rxjs observables in angular 6? And what are the advantages of rxjs over async/await? What is the purpose of defining Http response as Observable in Angular 2? Why promises have been dropped for the http service in Angular 2+? How can I `await` on an Rx Observable? What is the correct way to share the result of an Angular Http network call in RxJs 5? What is the difference between “ng-bootstrap” and “ngx-bootstrap”?